We’d love your help. Let us know what’s wrong with this preview of The Healing Power of the Breath by Richard P. Brown. Here’s a drug-free, side-effect free solution to common stress and mood problems—developed by two physicians. Millions of Americans suffer from mood problems and stress-related issues including anxiety, depression, insomnia, and trauma-induced emotions and behaviors; and most would prefer not to take medication for their conditions due to troublesome side effects, withdrawal symptoms, and disappointing success rates. Drs. Richard P. Brown and Patricia L. Gerbarg provide a drug-free alternative that works through a range of simple breathing techniques drawn from yoga, Buddhist meditation, the Chinese practice of qigong, Orthodox Christian monks, and other sources. These methods have been scientifically shown to be effective in alleviating specific stress and mood challenges such as anxiety, insomnia, post-traumatic stress disorder, and many others. The authors explain how breathing practices activate communication pathways between the mind and the body, positively impacting the brain and calming the stress response. The enclosed audio program guides readers through the techniques and helps make these breathing practices an ongoing part of daily life. To ask other readers questions about The Healing Power of the Breath, please sign up. Quick review for a quick read. To make a few notes on my reading on "The Healing Power of the Breath", I'll admit that I didn't have access to any of the supplemental materials that were noted to be included with this text. Considering that the text hinges so much on the audio CD and supplemental material, it's difficult to grade the helpfulness of this text without it. In searching for supplemental material on meditation, health/wellness, and breathing techniques to supplement my own practices Quick review for a quick read. To make a few notes on my reading on "The Healing Power of the Breath", I'll admit that I didn't have access to any of the supplemental materials that were noted to be included with this text. Considering that the text hinges so much on the audio CD and supplemental material, it's difficult to grade the helpfulness of this text without it. In searching for supplemental material on meditation, health/wellness, and breathing techniques to supplement my own practices - I came across this text on NetGalley. It's a useful text that expounds upon different techniques/approaches to breathing and how it ties into overall health and the mechanics of disease processes and body mechanics. It also (briefly) expound upon different populations that use breathing exercises. In addition, it addresses specific needs in terms of breathing exercises for various populations, such as those who suffer from anxiety and depression. The instructions are clear cut, and line up in such a way that you can follow along with the CD as it instructs, but I found the text by itself to be dry and tedious to move through for an introductory text. There were so many times when it would explain that it "would explain" certain techniques for breathing and I kept thinking "Why not explain it while you're on the subject instead of deferring it?" Also, there were very obvious anedotes to common problems with respect to meditation distractions here. Of course someone would know that their pet would be distracting in times of meditation; I wasn't turned off by the suggestion of taking one's pet to another room in that situation (because it's helpful advice), but rather the instruction in that case among others seemed to talk down to the reader in spells and state common sense practices. I think it could've streamlined the information much better and gotten to the heart of the chapter content much quicker than it did. I'm not going to say that this book isn't useful (because I found certain expansions to be enlightening), but considering the book doesn't stand well on its own for content and that it doesn't streamline the information as much as it could've, I think this wouldn't be a good singular resource for meditation/breathing practices. It, to me, left much more to be desired for presentation and intrigue on the subject matter. I didn't love the book as much as the accompanying CD - that was great! This thoughtfully written book and the enclosed CD that includes examples of different breathing techniques is excellent. I recommend this to anyone wishing to improve their sleep or to simply feel more calm. It's a great value with the CD. I read this book as part of a 5 week workshop I am participating in. Really enjoyed the CD. Wonderful. Exceedingly practical and simple, and for the most part, it steers clear of often accompanying New Age spirituality that turns off so many Westerners. As a Christian, I intend to do some extra study into their emphasis on qigong before I attempt to integrate that element, but it is only one element in addition to their core "Total Breath" practice. As an agoraphobe, just integrating their slower breathing techniques informally throughout the day has brought great relief from anxiety, Wonderful. Exceedingly practical and simple, and for the most part, it steers clear of often accompanying New Age spirituality that turns off so many Westerners. As an agoraphobe, just integrating their slower breathing techniques informally throughout the day has brought great relief from anxiety, and I look forward to a more formal practice and increased relief. Well written with good detail. Enjoyed the bit about knowledge of breathwork being passed on to members of the Russian Special Forces by way of medieval monks practicing the Jesus Prayer. Have not listened to the CD though there is some audio on this website run by associates of the authors. The long and short of it all is that practicing a slow breathing technique of five to six breaths in one minute (if you have trouble keeping count, just slowly expand your lungs to full capacity then hold a fe Well written with good detail. Enjoyed the bit about knowledge of breathwork being passed on to members of the Russian Special Forces by way of medieval monks practicing the Jesus Prayer. The long and short of it all is that practicing a slow breathing technique of five to six breaths in one minute (if you have trouble keeping count, just slowly expand your lungs to full capacity then hold a few moments before exhaling fully. pause before repeating the process) will suitably vary your heart rate value (HRV) in such a way as to re-invigorate your cardiovascular system and induce holistic healing, beginning at a cellular level. There's more to it than that, of course. I do yoga every day and have felt for myself the benefits of being aware of breath. This is a good book for some easy techniques to do to help you to feel less stressed and tired and to promote a more healthy lifestyle. The book comes with a CD to help with the exercises, I did not have the CD to listen to since I read the book on my Kindle so I cannot say how helpful it is. The book does do a good job of explaining why it is important to take the time to do breathing exercises and makes a good I do yoga every day and have felt for myself the benefits of being aware of breath. This is a good book for some easy techniques to do to help you to feel less stressed and tired and to promote a more healthy lifestyle. The book comes with a CD to help with the exercises, I did not have the CD to listen to since I read the book on my Kindle so I cannot say how helpful it is. The book does do a good job of explaining why it is important to take the time to do breathing exercises and makes a good case for giving their techniques a try. I have tried the Coherent Breathing and I found it helpful and relaxing. The 20 minutes a day breath practice have changed my life. I recommend this to everyone. If you want to know how to heal yourself and learn how humans are meant to breathe read this book and use the audio guides. The authors explore coherent breathing (5 breaths per minute to "induce a state of mental calm coupled with alert awareness"), resistance breathing (which "slightly increases pressure in the lungs, which heightens stimulation of the parasympathetic system, the soothing, recharging part of the nervous system"), breath moving, and total breath, plus some add-ons like body scanning and 4-4-6-2 breath counting. To give this book credit, the breathing exercises shared really are powerful. They're mos The authors explore coherent breathing (5 breaths per minute to "induce a state of mental calm coupled with alert awareness"), resistance breathing (which "slightly increases pressure in the lungs, which heightens stimulation of the parasympathetic system, the soothing, recharging part of the nervous system"), breath moving, and total breath, plus some add-ons like body scanning and 4-4-6-2 breath counting. To give this book credit, the breathing exercises shared really are powerful. They're mostly ones I've already implemented into my life so they weren't completely new to me, but nevertheless, they make it worth a look at the book. However, I found the writing to be a little dry, the organization to be a little iffy, and the testimonial stories to be a little fluff. The author offers a powerful, free and easily accessible solution - breath to relieve stress, stay calm and fight trauma and so on. It is an introductory book that provides guidelines on several breathing techniques that are deemed most useful and accessible to beginners. One is introduced to yoga and qigong breathing techniques too though no further deeper knowledge was drilled. 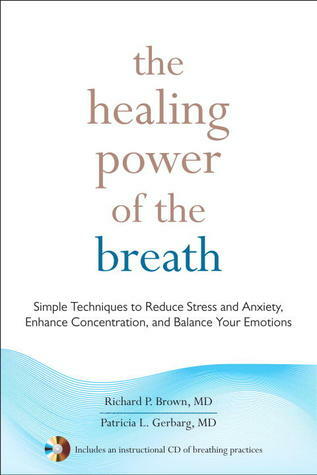 This books says that by deep breathing we can eliminate many health issues. I really tried but this was just too dry to get into! Great book, the exercises are great. I just don't like the examples in the middle. More reasoning could've been better. Very interesting ideas for dealing with stress, sleep, improve brain function through breath. I will start using some of the techniques in this book.